Give me 10 minutes today, and I’ll change the way you see that scripture. It’s perhaps the most hated scripture ever. Why? Because it’s a guilt trip over our money. Here take your hard earned money that you scratched and clawed your way up to make, the money that doesn’t ever seem to go far enough, the money that you desperately always need more of, and give some of it away. Oh and BE HAPPY ABOUT IT. It’s not just enough to give your money, but you better do it with a smile through your gritted teeth. Well, I’m not going to talk to you about money today. However, I will personally tell you, I’ve seen doors that were closed my entire life be flung wide open when I got my heart and mind right about money. But I truly believe that’s a lesson we each must learn on our own journey because no one is going to convince you the power of a dollar given until you do it under your own might. God loves a cheerful giver. Now here’s where I’m going to blow your mind. Ready … you have more to give than just your money and you have more places to give than just Sunday in Church. This is about your life and this is about your life today. Right here, this Monday. Will you be a cheerful giver? Let’s take an inventory of what you have available to give today. Your time. In this single day you have 24 hours – or 1,440 minutes. Will you give your time cheerfully to someone today? OR WILL IT BE A CHORE FOR YOU TO SIT DOWN AT THE TABLE WITH THEM? WILL IT BE A CHORE TO LISTEN? WILL IT BE A CHORE TO REALLY BE THERE? How many of us are there, but we’re not really there? We’re begrudgingly showing up and checking the box but we don’t really want to be there. That’s not GIVING your time … that’s allowing someone or something to TAKE your time. Today will you GIVE your time. Purposely. Intentionally. Cheerfully. Will you gladly be there? Will you fully be there? God loves that. He loves when you cheerfully show up for your own life and invest in it. He loves when you are fully there, engaged. Not because you have to, but because you GET to. What else do you have to give today? Your energy. Within you is the power to GSD. Get stuff done today. You have a set of 2 choices. Do it – or don’t do it. If you should do it, then you have another choice to make – Do it happy – or do it miserable. There are a whole lot of people showing up for work today miserable. They’re there, they’re completing the tasks before them, but it’s not because they want to be. How incredibly sad. How sad that there are moms holding babies, wishing they were somewhere else. How sad there are wives making the bed in an angry fit today. How sad there are daughters taking their gifts for granted and complaining about all the HAVE to do. Or the girl that landed the job and is bringing home the paycheck, you know the job she prayed for … and she’s just wishing she didn’t have to work today. Oh has she forgotten that job was given to her. It’s a blessing. She’s giving her energy to that work today, but it’s begrudgingly. But what if she could show up to work today and be a cheerful giver? Do you know how much better the day would be? Same work, different attitude. 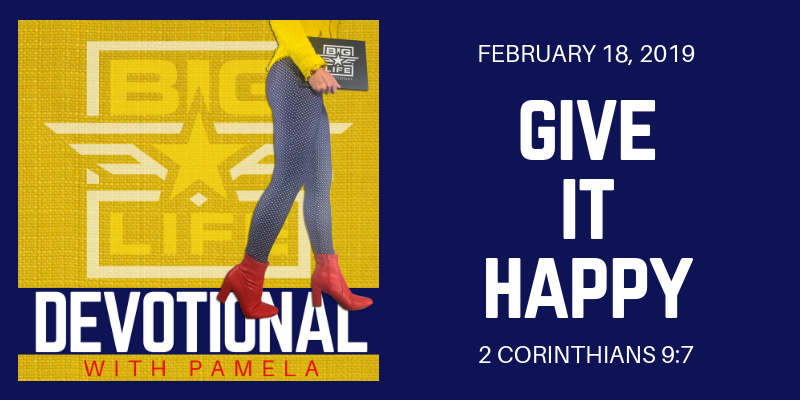 God loves a cheerful giver – yes I believe it brings him joy to see his girls giving of their time and energy with happiness – however on a deeper level I believe God loves a cheerful giver because he knows what it does for us. He knows he created us to thrive when we are giving our most valuable resources from a place of plenty. And there’s the secret … a place of plenty. Don’t you recognize you have more than enough? You don’t have to live in lack. Not when the creator of the universe is on your side. Not when the owner of the cattle on a thousand hills, the maker of heaven and earth, is in charge of your supply. It is our own mismanagement of time, energy and money that causes lack. God lacks nothing. You are his daughter … all he has he desires to make yours. BUT CAN YOU BE TRUSTED WITH IT? You have enough today. Enough time. Enough time to sit down and value the moments with your family. Enough time to do all you need to do and do it well. Enough energy. Enough energy to give your best. Today, you will be called on to give. Will you be a cheerful giver? Will you be absolutely giddy over the opportunity to give what you have, knowing that as you pour out, your cup will be filled right back up. Knowing that some things can only be received through giving first. I’m saying don’t just show up today, but show up and be happy about it. Don’t just work today, but work and be happy about it. Don’t just give today, but give and be a cheerful giver.